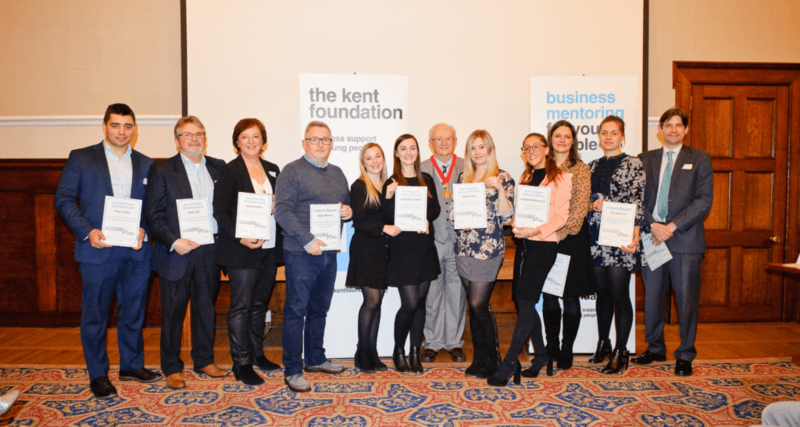 On the 15th January 2019, the Kent Foundation held is first Awards Evening. It took place in Sessions House, Maidstone and was very kindly hosted by the Chairman of Kent County Council, Cllr Mike Angell, to recognise and celebrate the outstanding achievements of our young entrepreneurs and hard working, dedicated team of volunteer business mentors. The evening was opened by Stuart Tanton (Director of the Kent Foundation) and saw three genres of awards being given to nominated trustees, mentors, and mentees following another successful year for The Kent Foundation, and the businesses we support. First, The Spirit of The Kent Foundation Award, Mike Angell (Chairman of Kent County Council) and Pip Lawrence (Kent Foundation Trustee) awarded those nominated volunteers who had promoted the vision of Kent Foundation, and made significant impact on their mentees and their businesses through the ongoing support they have provided. Eight people received this award. Congratulations go to Oliver Trailor, Adam Bissill, Michaela Partridge, Joanna Dennis, David Kirk, Bryan Hall, Rohani Emmanuelson, and Liz Jenkins. The second award of the evening recognised Start-up Business of the year. Cllr Mike Angell and Liz Jenkins (Kent Foundation Trustee and Mentor) awarded three young and hardworking businesses as a result of nominations from their mentors. The winners of this award were: Ellie Cachia of Renowned Resourcing, which connects people to their perfect job in the South East, including London, alongside mentor Adrian Wenn; Angie Everett-Penfold of Body Secrets, a massage specialist who also offers beauty service, with mentor Tunde Daczo; and Sophie and Katie Kember of Ruby Frances Bridal, an award winning wedding dress shop, with mentor Paul Markland. The final award of the evening, the Impact Award, was handed out by Cllr Mike Angell, Julian Kirkness (Chairman of Kent Foundation), and Ben Towers (Award-winning Young Entrepreneur) to three individuals who have individually made a huge contribution in promoting and supporting young people in business and had been nominated in recognition of it; this years incredible winners were Pip Lawrence, Roger Williams, and Adrien Wenn. A big thank you, and congratulations to you all for what you have achieved.